A fossilised skeleton of a meat-eating Jurassic dinosaur found on a south Wales beach is being revealed to the public for the first time. 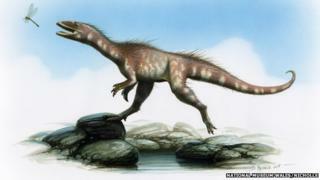 The small theropod dinosaur - a distant cousin of the giant Tyrannosaurus rex - was uncovered by spring storms in 2014 at Lavernock, Vale of Glamorgan. Fossil-hunting brothers Nick and Rob Hanigan made the discovery and are donating it to National Museum Wales. It is on display in National Museum Cardiff's main hall until September. Experts at the museum believe the fossilised remains date back more than 200 million years to the very earliest part of the Jurassic Period. The theropod is the first meat-eating dinosaur fossil to be found in Wales and is one of the oldest finds from the Jurassic Period in the world. The small dinosaur would have stood at about 20in high (50cm) and about 6.5ft (2m) in length. Fossils show it had lots of small blade-like teeth, suggesting it lived on insects, small mammals and other reptiles. The skeleton fossil was spotted by the Hanigan brothers after a cliff fall on Lavernock beach. They spent much of the last year carefully preparing five stone blocks to uncover the full fossil, before getting in touch with museum experts. "This is a once-in-a-lifetime find," said Nick Hanigan. "Preparing the skull to seeing the teeth of a theropod for the first time in 200 million years was fantastic - you just can't beat that sort of thing." His brother Rob added: "It has always been our intention to donate our dinosaur to the museum for the public and scientists to see and research." David Anderson, director general at National Museum Wales, said the exhibition gave visitors a "unique opportunity" to examine the fossilised remains of the first meat-eating dinosaur to be found in Wales - and "one of the oldest Jurassic dinosaurs in the world".